Today, contemporary trends and civil society sector development perspectives were discussed in Astana. Participants including CSO and relevant Ministry representatives discussed new ways and forms of productive interaction between government structures and civil society institutes. Principle speakers were Abzal Nukenov, Vice Minister of Religious Affairs and Civil Society of the Republic of Kazakhstan, Zauresh Battalova, President of “Fund for Development of Parliamentarism in Kazakhstan,” and Jamila Asanova, Executive Director of “Civil Society Development Association”. Acting as a moderator, Vice Minister Nukenov shared the results of the first year of the ministry’s work. 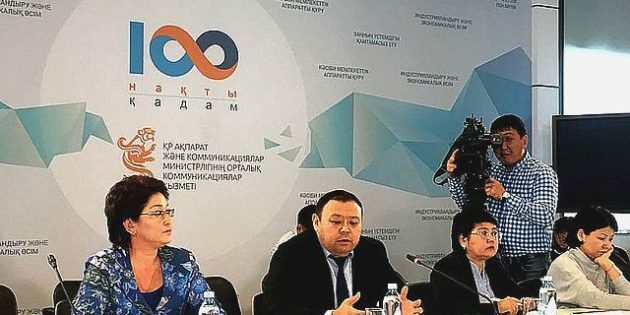 In, particular, he addressed implementation of new financial instruments in the form of grants and awards for CSOs, monitoring of the most pressing issues of concern for Kazakhstan’s citizens, and meetings between representatives of governmental agencies and the civil society sector and the work of Public Councils. The Ministry of Religious Affairs and Civil Society of the Republic of Kazakhstan was established a year ago, on September 13, 2016. During this period, the Ministry has launched an online portal “Hotline 114”; an online portal “CSO Database”, and the first award for CSOs, the state – businesses – CSOs trilateral platform entitled “Asar.” The Ministry has engaged in many other initiatives over the past year as well.